The World Series starts at the end of October. Are you hosting a party? Serving only hot dogs? Well, here are 3 healthy snacks for your World Series party. What you need: country- style bread or baguette (sliced diagonally), sea salt, olives, garlic, fresh vegetables and your best extra virgin olive oil. 1. 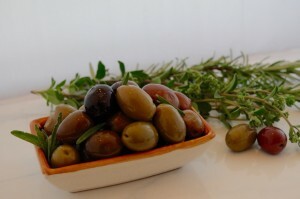 Marinated Olives – with olive oil! Transform your selection of olives into a delicious treat by making a marinade of olive oil, balsamic vinegar seasoning with rosemary, oregano or garlic. Grill slices of country-style bread (or baguette slices). Each person can make their own bruschetta by rubbing the bread slice with a clove of garlic, then drizzling extra virgin olive olive on the slice and sprinkling sea salt on top. Arrange peeled and cut fresh, raw vegetables on a platter and let your guests dip in olive oil, balsamic vinegar and sprinkle with sea salt or herbs. My favorite veggies are heirloom carrots, zucchini, florets of cauliflower, radishes, bell peppers, celery. If you include green beans or asparagus, you may wish to blanche them first. 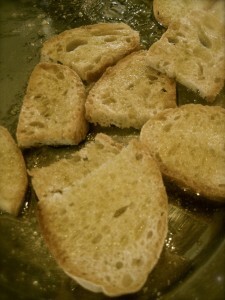 Make sure you have enough bread… and enough extra virgin olive oil for dipping and drizzling.